When were the first air-conditioned GM and Flxible New Looks delivered to the NYCTA/MTA? Also, were any of the older (non a/c) New Looks ever retrofitted with a/c, or did they remain non air-conditioned buses until retirement? There were a few experimental models in the Old Look buses, and when the New Looks came out in 1959, they were offered with air conditioning. The first ones I saw was DC Transit's "Articoolers". Although a few air-conditioned buses were in service previously, air-conditioning becomes a regular NYC Transit bus feature with the arrival of 682 vehicles known as the 8000 series." Always appreciate your input....thank you! I also remember (early/mid 80's) seeing Flex New Looks that had ad posters mounted over the vent work on the a/c units. I was always curious about this; I cannot see how the a/c could have worked in this fashion. Although OMOT's website maintains those A/C batwing Fishbowls were produced between January and February 1967. September 11, 1966 must've been when the contract was signed to produce them. On eBay are sections of a side roll sign for a MaBSTOA batwing that was dated December 13, 1966. Some now-gone routes such as "2 - 5th & Madison via Lenox" are among those in that roll sign that were cut up into individual sections. 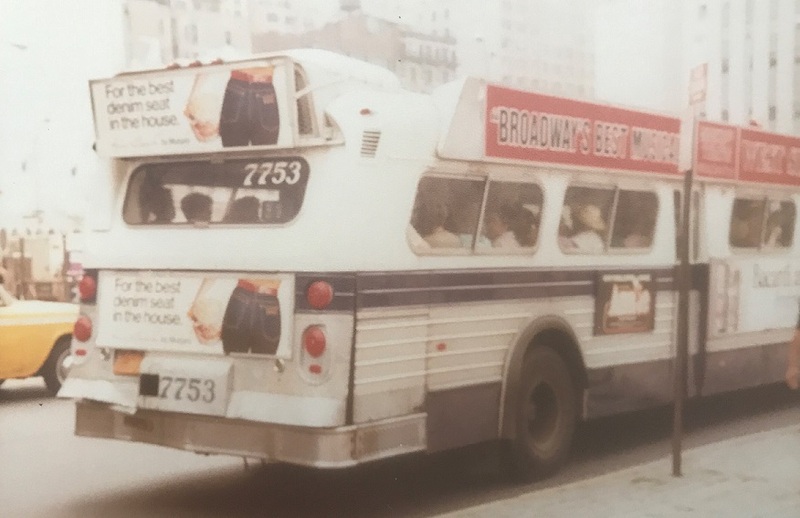 I have the same question as New York Omnibus 2629... how efficient was the a/c condenser when you had an ad rack in front of it? I mentioned these ad racks in another thread here on BusTalk. Note the white fleet numbers applied to the rear windshield and the size of said windshield. BTW, besides the a/c ad rack on 7753 they also appeared on some of the 9000 series Flxibles. I see you had the same question I had; I always wondered on just how efficiently the a/c units on these buses would function with an ad rack mounted over the grillwork. NYO. I was in seventh grade when the PCCs quit in Baltimore and it was a sad day. However, I had to admit that the New Looks that replaced them were stunning. Hard to believe that, this year, it will be 55 years since the #'s 8 and 15 streetcars went over to buses. Yes, the new BTC Fishbowls were indeed stunning, and "As Modern As Tomorrow!" NYO. We actually have one of the original BTC Fishbowls in our collection at the Baltimore Streetcar Museum. #1962. I had the pleasure of driving it last fall and even though it did not have power steering I had a blast. I have three CORGI BTC Fishbowls in my collection; these three are among my very favorites! .....am now wondering if ad racks mounted on the a/c units were exclusive to the Flx New Looks, or were these also used on the GM's? 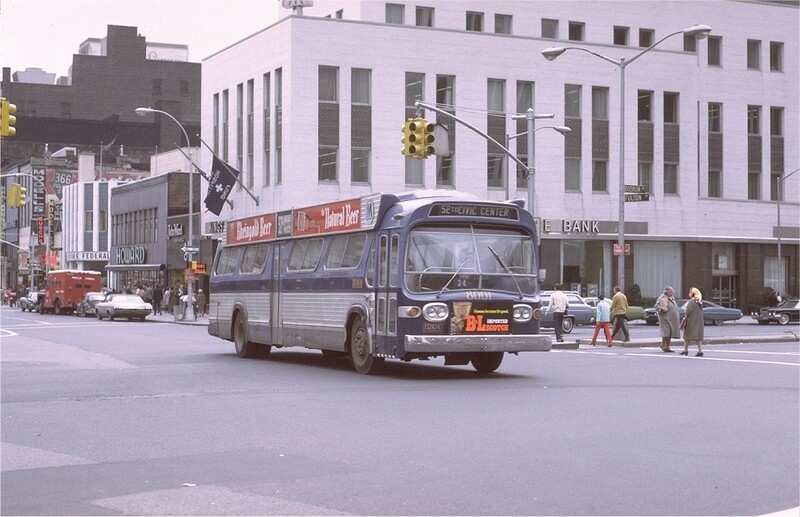 As per Traildriver's correct information, here's a picture of the very first A/C NYC Transit bus (excluding earlier experimentals).